Even if your newborn needs less baths in the earlier stages of infancy, that doesn’t mean that you shouldn’t invest in the right baby bathtub from the start. When looking at the Fisher Price 4-in-1 Sling ‘n Seat Tub vs. 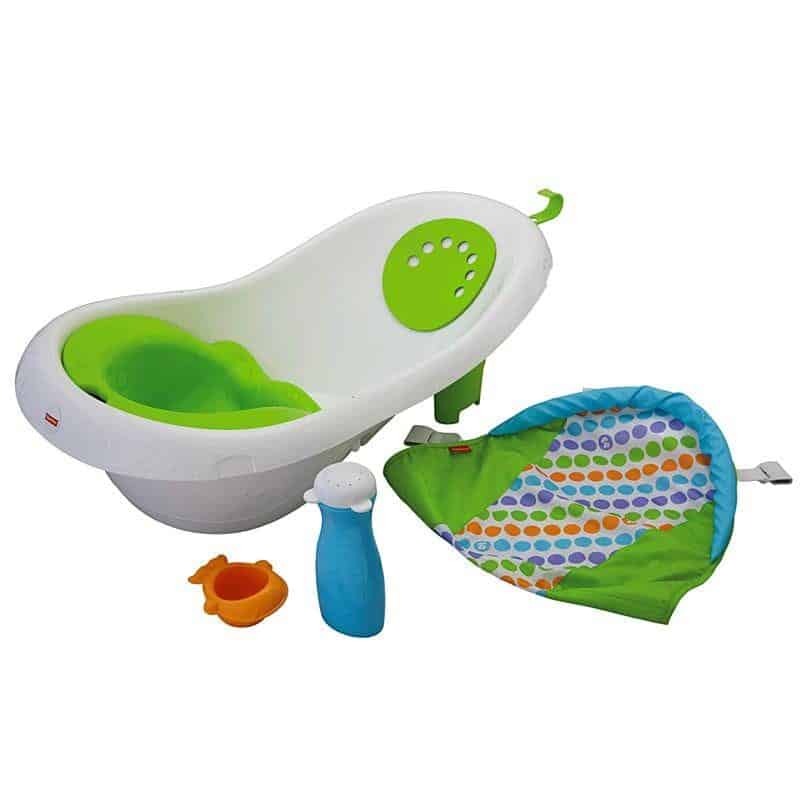 The First Years Sure Comfort Deluxe Newborn To Toddler Tub you definitely have two baby tubs which can grow with your little one while also providing them with a comfortable environment for bath time. While it’s plenty fun to give your little one baths in the actual bathtub and watch them enjoy bath time in that way, it’s also not very realistic for infants or small babies who really need to be placed in a baby bathtub within the actual tub to ensure their safety throughout bath time each night. Where the Fisher-Price tub might last for a bit longer than most other baby tubs and convert to a style that can even be used by your toddler, you may be done with The First Years Sure Comfort tub much sooner. So if it’s longevity you’re looking for, then it’s clear to see which of these tubs might be the best one for your family. On the other hand, The First Years tub is also half the cost of the Fisher-Price, and since cost is often a major factor in making these kinds of decisions, that’s important to keep in mind. With both options, though, you are getting a baby bathtub that can provide security and peace of mind for you while you bathe your infant in a comfortable environment each time. When it all comes down to it, the choice will be yours as you figure out which of these work best for your little one and your family. It’s hard to tell when your baby will be ready to transition from using an infant bath tub to being able to handle the actual bath tub with maybe some support added in there. Luckily with the Fisher Price 4-in-1 Sling ‘n Seat Tub, you won’t have to wonder for very long. With this particular tub, you’re given the option of starting with stage one when your baby is a newborn and allowing them to graduate through each stage until they reach stage four, which is the spacious toddler tub without any added seats or slings to help support them. Of course you can judge whether or not your toddler will even need the tub when he or she reaches this stage, but it’s still comforting to know that the Fisher Price 4-in-1 Sling ‘n Seat Tub will be there for them every step of the way. For your baby’s safety, the tub also includes an insert to help prevent slipping or sliding when you’re washing your infant during their bath time. Since the tub is made of a hard plastic, this is especially useful at all times. There’s also a plug you can pull out to easily drain out all excess water before you clean out the tub after each use. As some baby bathtubs are simply meant to have water fill them up and then poured out, this is another useful feature that will help you maintain the cleanliness of the baby bathtub and really get years of use out of it. And it also helps that Fisher Price is already a well known and trusted brand associated with plenty of products for baby and toddlerhood. Different Stages: Stage one has a soft sling for newborns, stage two utilizes the baby stopper insert, stage three for the support inserts for sitting up, and stage four allows you to take everything out of the tub and use it as a roomy toddler tub for your child. Storage: When your baby is finished with his or her bath, you can easily hang the tub to dry and then store it anywhere that will allow for a hook, as it has a hook already connected to it. Weight Limit: The tub is meant for children up to 25 pounds. Price: On Amazon, the Fisher-Price 4-In-1 Sling ‘n Seat Tub is $32. Check out the latest price! Where To Buy: You can find the bathtub on the manufacturer’s website and on Amazon or in-store at Target and Walmart. The several different stages with which you can use the toddler tub are convenient for your growing baby. When it’s time to lean up and empty out the tub, the removable plug stopper can be utilized. The tub may also be able to fit in your kitchen sink if that’s more convenient for bath time. The green insert seat also has holes so it will be easy to drain and properly clean that as well when you’re cleaning out the bathtub. When using the newborn sling, your baby will be cradled and comfortable in a natural feeling position, which could mean less fussiness during bath time. When it’s time to take out the green seat, either for cleaning or moving on to the next stage, it can be difficult to get it out each time. And to get to the plug when the seat is inside of the tub, you need to remove the seat each time to do so, as the plus is underneath the seat. For some, the straps of the sling seat might come loose, which can be dangerous and may require a replacement for some. “This was the perfect tub for my long baby. He was too long to fit in our other infant tub and not sitting up yet so the seat section was perfect. He sits up now and we still use it for him. Little toys were extra bonus.” – Linda Polasek on Amazon. “Seriously the best baby bath tub ever!!! We were having trouble with baths because my son is a big baby and was outgrowing the baby bath but not safe to be sitting up in a tub by himself yet. We bought this and wished we would have had it for all of our kids! We are still using it at 12 months old and he loves it!” – Kelly N. Wittenmyer on Amazon. “Really love many things, the simplicity ability to store easily and adapt with the pieces to growing stages. Love the net and easy to clean! Toys available are perfect for soothing rinsing and play.” Chelsea Hale on Amazon. “One of the best purchases for my baby! I love this bathtub. Makes bath time a breeze for me and my baby loves bath time so much more now. Would definitely recommend to other parents!” – Kanwal Malik on Amazon. The First Years Sure Comfort Deluxe Newborn to Toddler Tub comes in either pink or blue to allow you a fun color for your little one and like the Fisher Price tub, it can potentially be used for every stage until your child is ready for the actual bathtub. Unlike the Fisher Price 4-in-1, it doesn’t have all of the different inserts to signify a new stage of the baby tub, but it does have qualities that enable it to be able to be used as your baby transitions to different physical milestones. It does have an infant sling to start out with to keep your newborn comfortable and safe as you wash him or her, and eventually, you can easily remove that to use the baby tub itself. As your baby grows, they’ll be able to lounge in the shapes side of the tub and after that, they can transition to sitting up facing the opposite way. This means that your infant, baby, and small toddler will be able to use the bathtub, but you’ll never have to keep track of a handful of different inserts you might need along the way. There are non-slip pads built-in, but because they’re made to be a permanent part of the tub, they’re also mildew-resistant, which is a real concern when it comes to baby bathtubs. It may not have as many bells and whistles as some other similar baby tubs, but it does get the job done right and it’s more than simply an infant bathtub. Different Stages: Your newborn can use the sling, then transition to the lounging side, and eventually use the opposite side of the tub, which is made to act as a seat to allow them to sit up and play during bath time. Storage: It doesn’t come with a built-in hook, but you may still be able to hang it on a plastic hook on the wall, from under its rounded edges. Weight Limit: The tub is designed for babies up to 25 pounds. Price: On Amazon, the The First Years Sure Comfort Deluxe Newborn To Toddler Tub is $20. Where To Buy: You can find it on the manufacturer’s website and on Amazon or in store at Buy Buy Baby. The tub is relatively lightweight, which can make it easier to take out and put away after each use, and also move around the house. There’s also a drain plug that even changes color when the temperature is too warm, which is more useful than simply a standard plug. The newborn sling has padding to it, which adds to your little one’s comfort throughout bath time. You can store bath toys and even soap in the small built-in insert in the baby tub. Despite not having inserts for different stages, other than the sling, the tub is designed to grow with your baby and remain as their bathtub into toddlerhood. It may take up a substantial amount of room, which isn’t idea for small bathrooms. While the newt is useful for newborns, it can also make it difficult to keep them warm with the warm water, as they’ll be exposed to more cold air than anything. In some cases, it won’t fit over or inside of recessed sinks, which is sometimes a more useful way of getting bathtime done with infants. “This has been great for our baby. Started using it at four months old, when he was about 17 lbs, so we never needed the infant hammock. I was concerned to buy this at first, because of a “bump” people talked about that went into their kids’ backs. The bump is the little shelf they sit on to stay upright… Not sure how other people are laying their kids in here, but it works well in my opinion.” – Will Arvin on Amazon. “This is a great, simple bath tub. The sling works well for newborn babies, and the tub works well for 3-4 months without the sling when the baby still needs to have support. Then the other side of the tub works for six months plus when your baby can sit without support. could be used through the first year or until baby is ready to sit in the regular tub.” – Jamie Miles on Amazon. “This is a great little tub. It is the perfect way to give your baby a bath and still keep them safe. It even comes with the insert for a newborn. I would definitely put this on my must buy list when you are having a baby.” – Edna Blakely on Amazon. “This is one of the better purchases I made for our son. It was very easy to use the soft mesh sling when he was teenie tiny, and when he could hold up his head it easily converted to an infant tub. He still likes the security of the tub now that he’s two! !” – Jane Thurmond on Amazon. There’s nothing in the parenting rule book that says you need to have the most perfect, top of the line baby bath tub in order to be the best parent there is. Whatever works best for your little one and keeps them happy, safe, and secure is truly all that matters. And while it’s hard to ignore the benefits of the Fisher-Price 4-In-1 Sling ‘n Seat Tub has all of the little features to transform it into a different sort of tub for each stage, it may not be the one for you. Instead, the stronger and more reasonable option may in fact be the The First Years Sure Comfort Deluxe Newborn To Toddler Tub. It can also be used at different points in your baby’s development and like the Fisher Price tub, it does have the convenient and safe mesh sling for newborns. Other than that, it also has the convenient plug to drain out water afterwards and different ridges within the plastic to allow your baby to use it as he or she grows. And it’s also plenty affordable for most families without breaking the bank for a baby item that won’t be used forever, even if it will be utilized for quite some time. At the end of the day, you don’t necessarily have to purchase a baby tub for your little one. You can do what feels the most natural and what will keep your infant comfortable and safe throughout each bath time process. But if you do want to find the right baby bathtub for your little girl or boy, then it’s important to consider how long you’ll be able to get use out of it, how affordable it is for you, and also how comfortable they’ll be in the end. With the First Years Sure Comfort Deluxe Newborn to Toddler Tub, you’ll be able to check off most of your boxes for what you’re looking for and your baby will be happy too, which is what really matters in the end.